Plans for an ex-colliery site would turn it into an "Eden Project of the East Midlands", those behind it claim. Nottinghamshire's Clipstone headstocks - believed to be among the tallest ever built - have been debated since the pit closed in 2003. A plan to use the Grade-II listed structures as the centrepiece of an activity centre will be submitted to the Heritage Lottery Fund. Supporters said the £25m scheme would bring investment to a deprived area. 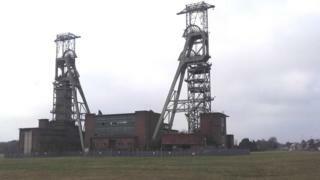 Despite calls for them to be demolished, the Save Clipstone Colliery Headstocks group has spent years building support for plans to convert the surviving buildings into a sports and leisure hub. Boasting a mile-long, 100-mph zip wire, tethered parachute jumps and indoor skydiving, the centre is transform the area into a tourist destination, campaigners said. Denise Barraclough, from the group, said: "This has the potential to be a major part of a big tourist offering in the East Midlands, it has been compared to an Eden Project for the East Midlands. "With an enterprise zone for businesses and an area for affordable housing, it benefits the area in several ways." After meetings with Heritage Lottery Fund officials, the group is submitting an initial bid for money to support surveys, business plans and feasibility studies. It is hoped an application for full funding could be finalised later this year. Dr David Amos, who studies the cultural impact of mining said: "It's an important time to consider the social impact of coal mining. "The generation which was directly worked down the mines is getting older and what happens now will help determine how it is remembered."